Pilot Season is canceled but the shows live on! + Learn about the first season and meet the Brass family in our latest Pilot Season update! + Are your dice misbehaving? We have the cure! + Thanks to Sugar Gamers for the great article! + The funny is coming, ready or not! 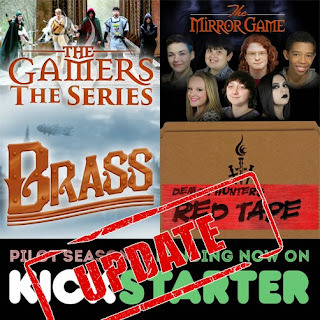 + Learn about The Mirror Game in our latest Pilot Season update! + [The Coffee Table] Season Two is live on the tube! + [Standard Action] Why does this make me think of Wendy? + Another playtest of the new Demon Hunters RPG: A Comedy of Terrors..
+ Only 945 sign-ups to go. If you want JourneyQuest Season 3, have you signed up to pledge? + [Transolar Galactica] Hey Legion, do you know what's cooler than a Gulak-Pop in a Karathian Snow Storm?? + [Gamer Chick] Hey folks! Gen Con event registration doesn't officially open for a few days, but we are hosting another Gamer Chick RPG session this year! + May the Fourth Be With You! Love this video from my Alma Mater!! + Super Geeked Up - Ep. 129 - Avengers: Age of Ultron, LA Macabre, Geeky Movie Mashup! + So much fun last night with the Goons on Super Geeked Up! + We're super-excited to join the amazing online network JTS.TV - Just The Story! + Round Two of ‪#‎Avengers‬ Character Cage Match.